I’ve had cakes on my mind these last couple of weeks as much as I have pie, in large part because we’ve been sampling cake from The Harvest Baker at book signings here in the south recently. Nobody can question my love of pies, but the cakes in The Harvest Baker are so wildly wonderful and, just as important, most of them travel a heck of a lot better than your typical pie, thus our decision to take along cakes. And travel these cakes have, from book signings to baking demos for the better part of a thousand miles. The Back Bumper Blueberry Cream Cheese Poundcake has been the big star because that’s the only one we took on the road and I knew, pardon my bluntness, that it would sell books better than anything I could possibly say about The Harvest Baker. Plus, it’s made with cream cheese and butter, which keeps it moist for days on end. Even after nearly a week living out of a cooler, the cakes held up beautifully. 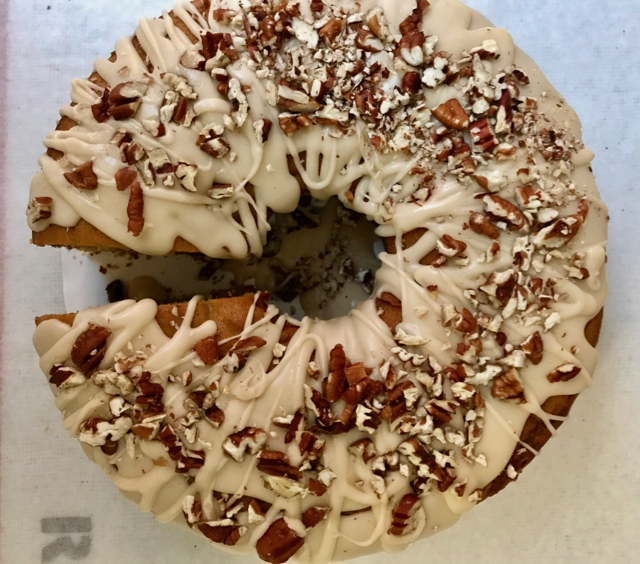 Next time we do The Harvest Baker road trip here in the south we’ll bring that one plus the one you see here, the Sweet Potato Pound Cake with Maple Syrup Glaze. I love this cake because it so nicely captures the soul of harvest baking, the spirit of which lives squarely at the corner of fresh produce and a passions for baking. 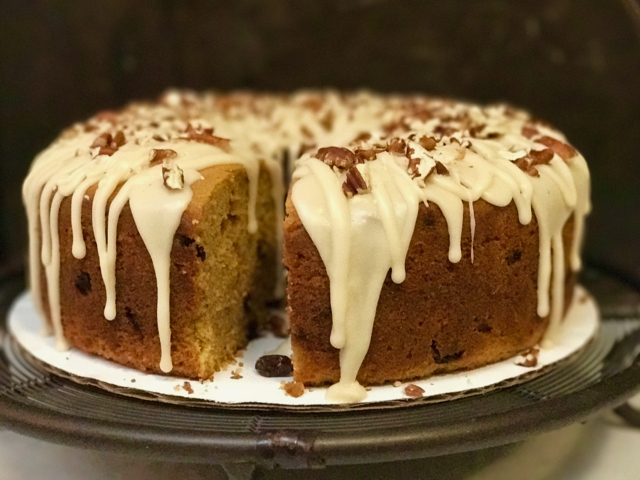 We make the cake with our own sweet potato puree, nothing more complicated than baked sweet potatoes buzzed in a food processor. 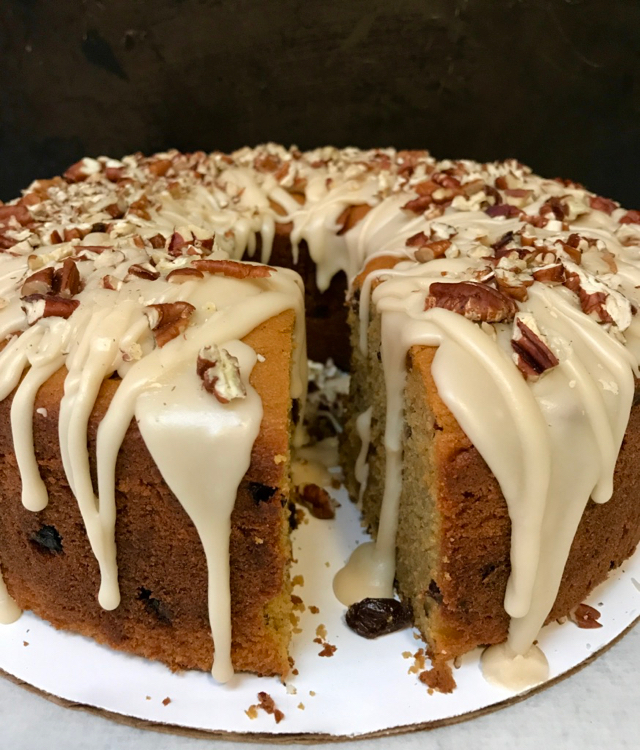 Like so many other harvest baked goods that incorporate fresh produce, the sweet potato puree adds moisture and keep-ability to the cake. That’s good news, especially this time of year, when guests start arriving from out of town: make this early in the week, and it will stay fresh clear through the weekend and beyond. Don’t skip the maple syrup glaze; the cake is fabulous without it, but even better with. It dresses up the cake just beautifully. 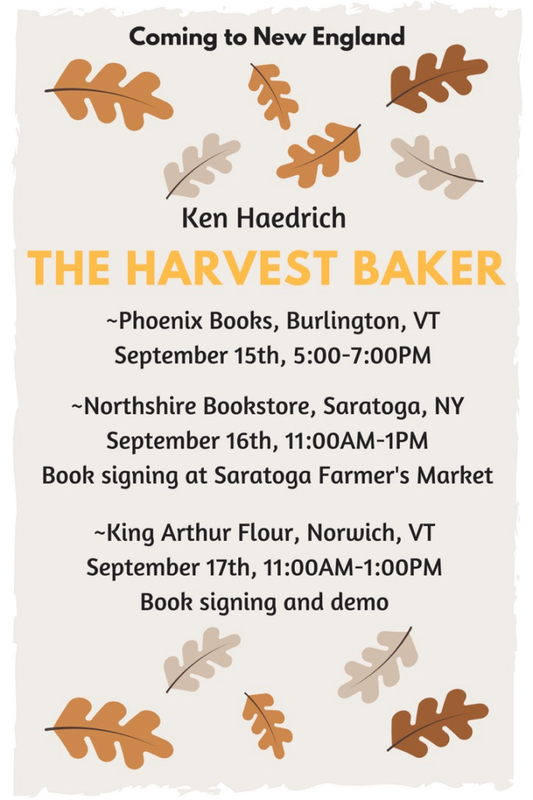 I’m posting my upcoming events for The Harvest Baker below, two in New England and one in upstate New York. I sure hope you can make it to one of them. If so, I’d love to meet you. -We’re still offering our special $3.00 shipping per book special (in the lower 48 only) on The Harvest Baker. Let us know if you’d like an autographed copy. Just send us an email and tell us you’re interested in this special deal. -Speaking of maple syrup, in case you didn’t know I’m a maple lover from way back and my book – Maple Syrup Cookbook – is my love letter to it. You can read about it here. That’s on special now too, for just $3.00 shipping. To get a copy at this price, send us an email to order. -Our Lowcountry Pie Getaway in Charleston is just weeks away now and there are a couple of openings left, if you’d like to get in under the wire. We’d love to have you. Just send us an email and we’ll get you a registration form and schedule. This is your opportunity to really get your pie game on, make new friends, and soak up the Southern charm and hospitality of America’s favorite destination city. I couldn’t possibly sign off without sending our prayers and thoughts to our friends in Texas, some of whom have been victims of the Hurricane Harvey flooding. It’s been both heartbreaking to watch this tragedy unfold, and heartwarming to see the way the good people of Texas have supported one another in this time of need. We will continue to pray for you and wish you fortitude as you begin to clean up and rebuild. God bless. Preheat the oven to 350°. Adjust your oven rack so it's one position below the middle. Butter a 12- to 14-cup one piece tube pan and dust it with flour. Sift the flour, baking powder, salt, baking soda, cinnamon, ginger, cloves, and nutmeg into a large bowl. Combine the granulated sugar, brown sugar, butter, and oil in a separate large bowl. Using an electric mixer - a stand mixer, if you have one - beat on medium-high speed until combined. Add the eggs, one at a time, beating well after each addition. Add the vanilla and sweet potato puree. Continue to beat until evenly blended. Beat half of the dry ingredients into the liquid on low speed, until thoroughly mixed. Beat in the buttermilk on low speed. Add the remaining dry ingredients and blend them in on low speed, until the batter is evenly mixed. Stir in the 1 1/2 cups chopped pecans. Spoon or pour the warm Maple Syrup Glaze over the cake and allow to cool. If you're using nuts on top of the cake, apply them generously to the top of the cake immediately after adding the glaze, so they stick. Press lightly to embed, if necessary.) Cool thoroughly, then keep refrigerated. Cut slices about an hour ahead and bring them to room temp before serving. NOTE: To make the sweet potato puree, preheat the oven to 400°. Scrub 3 good-size sweet potatoes under running water. Pierce each one several times with a paring knife. Place them on a foil or parchment lined baking sheet and bake for 50 to 60 minutes, until tender through and through when pierced with a knife. Split open, cool thoroughly, and transfer the flesh to a food processor. Process to a very smooth puree. MAPLE SYRUP GLAZE - Gently warm 3 tablespoons unsalted butter and 1/3 cup pure maple syrup in a small saucepan until the butter melts. Transfer to a mixing bowl and whisk in 1 1/2 cups confectioners' sugar (sifted) until smooth. Use right away.